Follow the Money is an award-winning collection of ten interconnected short stories that will grab you, wrestle you to the ground and squeeze you until your funny bone snaps in two. A botched kidnapping, a money scam, a not-so-average convenience store holdup … each story flows (with the money) through a series of interesting, and sometimes bizarre, plots. Layered and interweaved with seamless complexity, recurring characters and everyday motifs bind the ten stories into a single universal plot. 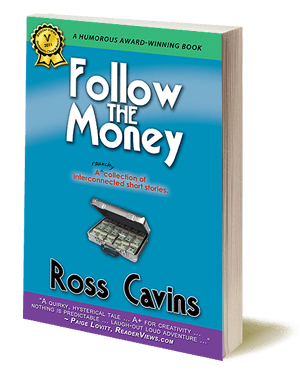 Ingenious in its conception, flawless in its execution, Follow the Money is a hilarious, detailed study on the many facets of the human condition. Greed, Pride, Lust … the seven deadly sins have never been so entertaining. Prepare yourself for a raunchy, gritty ride you’ll never want to end. orGet your autographed copy from us.